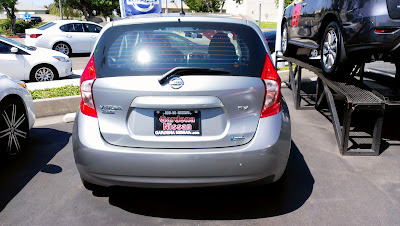 For whatever reason, Nissan decided to call the new hatchback version of the Versa the "Note." 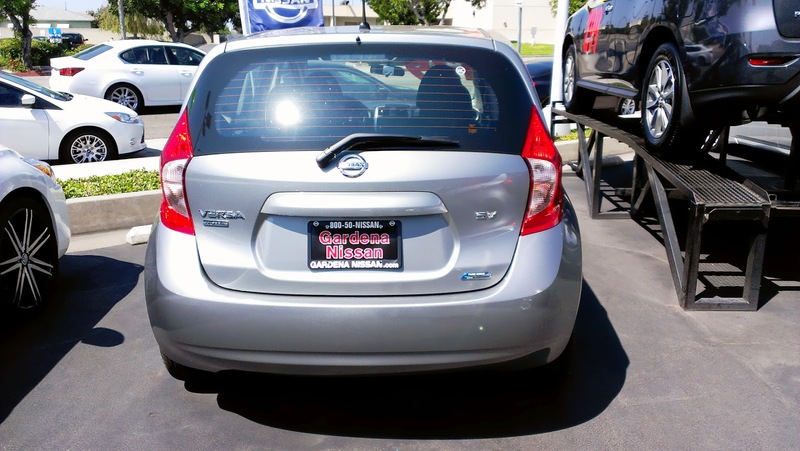 I am not exactly sure how the average person is supposed to know right off the bat that this is the hatchback version without seeing it, but I suppose Nissan expects us to use process of elimination to figure it out. The sedan version of the Versa is still called the Versa Sedan. By process of elimination, that must mean the "Note" is the hatchback version. Ta da! Forgetting the silly name for now, the Versa Note is still a pretty mediocre looking car. The front end does stand out, but not in a good way. It just looks silly. Like the previous generation of Mazda's vehicles, it looks like the car is constantly smiling. Unlike the previous crop of Mazda's vehicles though, the Versa Note's "smile" looks more dopey than joyful. I had almost wish that Nissan made the front end of the car as plain as the rear end, at least that way the entire car would be the same shade of boring from nose to tail. One of the biggest complaints about the previous generation Versa from the automotive press was how cheap and uninspired its interior was. It would seem that Nissan buried their heads in the sand and opted not to listen. The Versa Note's interior is still incredibly cheap. While the Versa Note we test drove was not one of the higher trimmed models, it is still no excuse to cheap out on the interior. Even the lowest trim level Mazda2 we tested had a better interior than this Honda Fit knock-off. In an effort to class up the interior a bit, Nissan decided to add chrome to the door handles. The effect the chrome has on the car though, is the exact opposite of what they probably intended. Instead of looking just cheap, the interior of the car now looks cheap AND tacky. 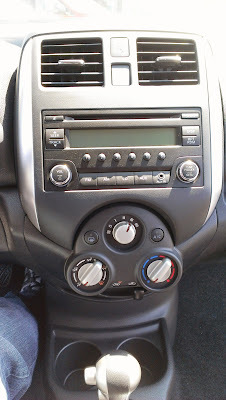 While the overall quality of the Versa Note's interior can only be described as cheap, it is at least quite spacious. Sitting in the back seat, I had plenty of leg room. Even the salesman, who was at least three to four inches taller than me, had some left over leg room while sitting in the back. The car is also tall enough that taller passengers can sit comfortably in the back without worrying about bashing their head into the roof going over a bump. The large passenger seating also translates to a fairly decent amount of cargo space. With the rear seats up, cargo space comes in at a decent 21.4 cu.ft.. Seats down, cargo space increases to 38.3 cu.ft. While definitely not the largest amount of seat down cargo space, it is still enough to swallow up plenty of the crap that is sitting in your garage. Just as the interior and exterior of the car wanted to put me to sleep, the power plant and drive train made me equally groggy. At 1.6 liters, the Versa's inline-4 may be one of the larger engines in its class, but it is also one of the weakest. At 109 horsepower and 107 lb./ft. of torque, this car clearly is not going anywhere fast. 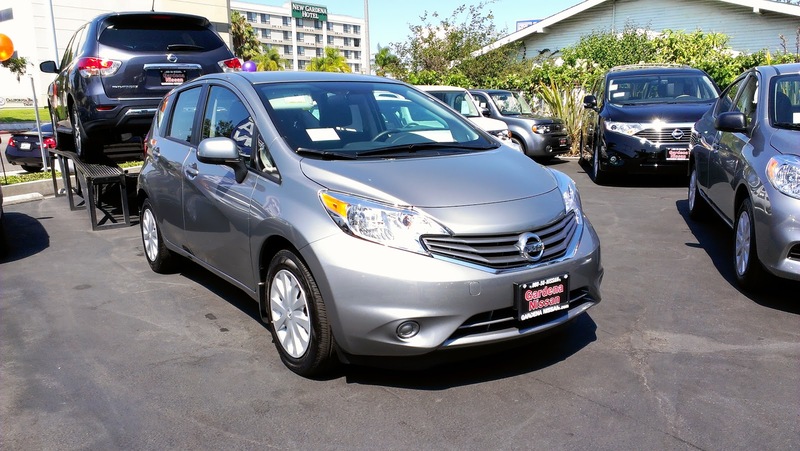 Coupled with the odd and slightly jerky continuously variable transmission (CVT), the Versa becomes an instant snooze fest. You can try to kick things up by mashing on the gas pedal, but rather than a burst of power, you will be treated to the 1.6 liter wheezing and struggling to make the car accelerate. It feels like the engine suffers from a case of asthma. Going hard on the gas also seems to confuse the transmission as it feels like it does not know where on that giant single cog it should be. The only plus to this engine and transmission combination are the stellar 31 city/40 highway EPA MPG figures, which supposedly can only be achieved with the CVT, and not the manual. I suppose the funniest thing about this car was that its handling kept me wide awake, but in the worst way possible. Twitchy and nervous is probably the best way to describe how the Versa Note handles. The skinny wheels, economy oriented tires, extremely soft suspension, and what feels like is a lack of any sort of anti-roll bar made me extremely nervous while driving the car. Any sort of hard cornering made the car roll and understeer so much that it felt like it was going to tip over. The nervous handling, coupled with the uncommunicative and feather light steering makes this car an enthusiast's nightmare. The only real redeeming quality of the car's suspension tuning is that because it is so soft, it is at least comfortable in normal cruising situations. Long story short, the new generation of the Nissan Versa will most likely end up being a rental car staple, just like its predecessor. Its driving dynamics can be best described as skittish, the engine is weak and noisy, the interior is cheap, and the overall styling of the car is inconspicuous. 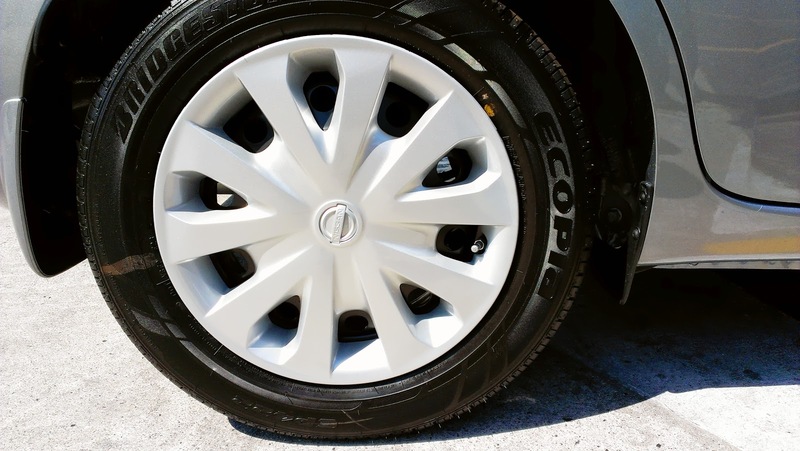 Along with its stellar EPA rating, these are all the things that make a great rental car, but not a car worth owning. Look forward to getting this car as a rental next time you head over to Hertz or Enterprise, but I would definitely advise against buying one. Oh, and those quirky Nissan commercials trying to depict the Versa Note as a fun, hip vehicle? They are a lie, just like Lance Armstrong. When I think of sporty compact cars, I think of cars like the Mazda2, the Volkswagen GTI, or even my own Honda Fit Sport. 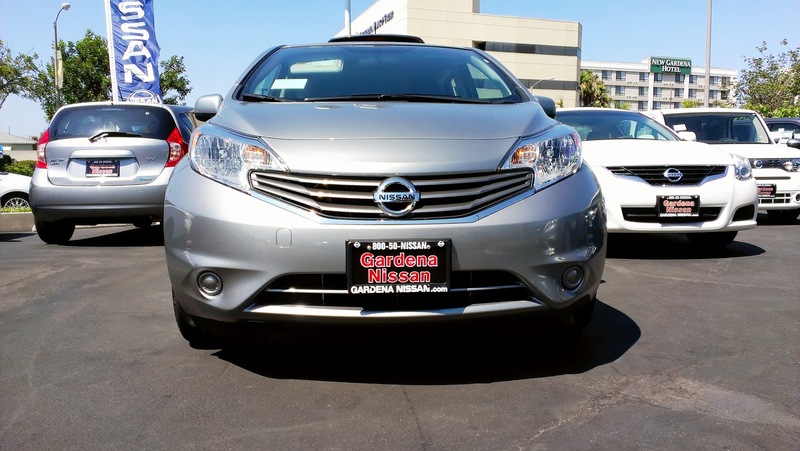 While the Versa does posses a slightly sporty look from certain angles, it definitely does not posses the same sporty look as other cars in this segment. 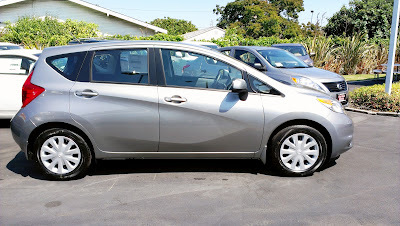 From most angles, the Versa looks boring, like from the side and the rear. It might be the lack of sporty looking bits like a spoiler, but even the Mazda2 manages to look sporty without any extra flair. The inside of the car feels boring and cheap. All of the plastic bits in the car look tacked on and fragile. 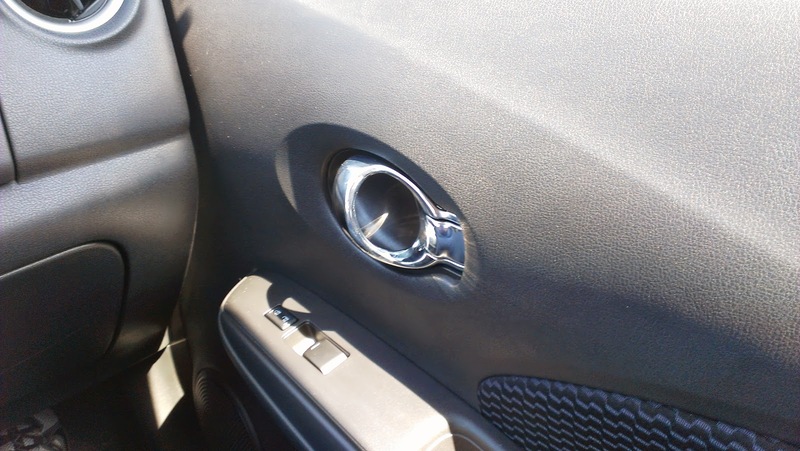 Nissan tried to make the interior look a little more upscale by adding metallic flake to the dark plastic pieces, and by adding chrome to the door handles and radio knobs. Instead of making the car look more upscale, the metallic plastic and chrome bits actually make the inside of the car look tacky. The knobs for the air conditioning look especially cheap, as if they came off a toy car and were not designed for an actual full sized car. The rest of the interior was average. The rear had a lot of room and the seats were pretty comfortable, but the checkered cloth pattern was a little bit much. Cargo space seemed to be pretty good. It did bother me that the rear seats did not fold completely flat, which compromises the cargo area. It seems like there is a lot of space for cargo, but if you need to lay something flat in the back, you are out of luck. I think the Versa's biggest problem has to be its engine. It feels really weak, and when I step on the gas the car feels like it struggles to move and the engine sounds like it is gasping for air. The transmission feels especially strange. It is a transmission that I am not used to, but it makes the car feel jerky when it accelerates. Once it settles down, the engine feels smoother, but it still sounds like it struggles. Handling does not feel safe in this car. It rolls a lot when going through corners quick. I am not sure if it is because of the car's height, or because the car feels incredibly soft, but I just do not feel safe doing anything sudden in this car. At the very least, the soft feeling suspension means it should be comfortable on long drives. I cannot say that I enjoyed driving the Versa Note. Overall, it is a pretty boring vehicle with very nervous handling. The only way I would be caught dead driving one of these is if it was given to me as a rental car and there was nothing else to drive. I am also pretty certain that had this version of the Versa been around two years ago, I would definitely not have considered it. 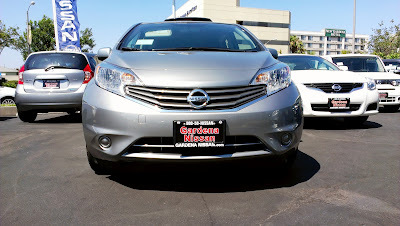 *Special thanks to Gardena Nissan for letting us test drive their vehicle.